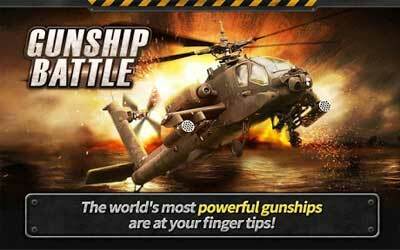 This is old version GUNSHIP BATTLE : Helicopter 3D 2.4.01 apk for Android, you can install it if you want to downgrade or install old app. It is top Action apps from JOYCITY Corp..
As one of the most downloaded game, GUNSHIP BATTLE is using the special 3D flight technology visualization. All the mechanism has been optimized to reach the best playing experience. Various types of plane or helicopters are also available. Each of them is having the special features and even character when fight. This fun game is belonging to the most wanted mobile FPS game in this time. It happens because there are so many varieties of weapons and even the tools to support your fight. Some custom missions are also available and are directed for you who are looking for the spacious gaming sensation. The missions are inspired by the real world and real crime case. Of course it can remind us; in the same time we can also make sure that the war is more realistic. For the user of tablet, you can still enjoy the performance of GUNSHIP BATTLE : Helicopter 3D for android because it has been optimized properly. Enjoy controls optimized for 3D flight. Select from a wide range of helicopters, each with unique characteristics. Arm your chopper with a variety of weapons and equipment. Challenge yourself with the next mission or replay a custom mission. Also optimized for tablet devices.